The Ultiworld 2017 Women’s Player of the Year award is presented by VC Ultimate. All opinions are those of the authors. Thanks for supporting the brands that make Ultiworld possible! 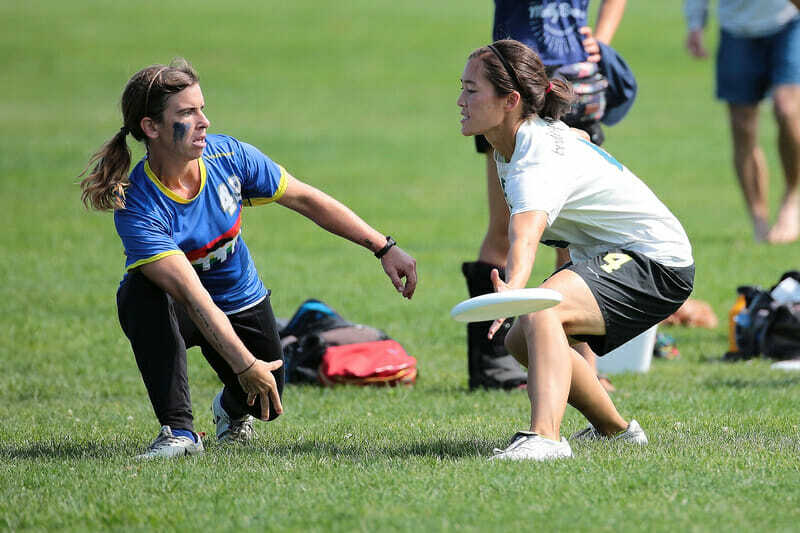 Ultiworld is pleased to announced our third annual Women’s Club Player of the Year award. While we consider both regular season and postseason performance, because of the nature of the club division, we weight success in the Series and at Nationals above all else. The All-Club teams are selected based on input from Ultiworld reporters, contributors, and editors. We could carefully lay out the case for why Claire Chastain is the 2017 Women’s Club Player of the Year. We could detail her statistics (impressive) and highlight Molly Brown’s steady evolution into an elite program under her leadership. Understanding why Chastain is the player of the year, however, is easiest to grasp when you watch her play. Watch Chastain’s feet as she break ankles on strike cuts with the efficiency and explosiveness of a piston. Study her discipline in the reset handler space. And sign up for the clinic she hosts whenever she’s on defense. Chastain is a longtime resident on award shortlists. She was on Ultiworld’s 2015 1st Team, and in 2016 she was the first runner-up for Player of the Year as well as Offensive Player of the Year after she marched Molly Brown to their strongest semifinal performance to date. Last year, Denver’s offense was designed around Chastain and Opi Payne’s break throws and quick handler movement. The offense was lethal, but it wasn’t enough to advance. In her third year as a captain, Chastain helped steer the team in a new direction this season. The offense relied less on her break throws and more on using space and team depth. Chastain’s stats lines at each Nationals reflect the shift: in 2016, she had four goals, 12 assists, and two blocks. This year, she racked up eight goals, seven assists, and three blocks. Chastain played a better-rounded role on a stronger team this year. Make no mistake. Chastain is still a star, and she stood out on a team of superstars this season. She led Molly Brown with 56 season assists, and she was the team’s third highest goal scorer (24). Among the top five women’s teams, only Scandal’s Jenny Fey comes close to this kind of season-long dominance (12G, 56A, 12D). No matter who set their mark on Chastain this season, she took the throw she wanted. She worked defenders into the ground point after point, and then she could stay on the line to play defense. Chastain lead the unsinkable Molly Brown a few points closer to the championship final this year because, simply, she was unstoppable. Kami Groom is playing her way, season by season, into our sport’s hall of fame. The 2016 Player of the Year submitted another dominant season for Brute Squad, during which she had 21G, 25A, and 14D. 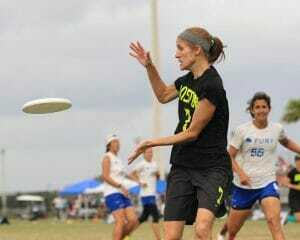 Against the division’s best talent in Sarasota, she racked up 11G, 14A, and 8D. Groom was in the conversation for nearly every award this season. On defense, she usually matched with opponents’ fastest athletes, and she won every foot race downfield. On offense, Groom’s timing and sheer speed earned her yards of separation in the red zone where she could catch the disc and distribute it easily for the goal. Perhaps most tellingly, Groom was one of the few players who the Brute Squad coaches pulled to play on several lines. When Brute Squad needed to take half, they sent Groom onto the field. When Boston faced a 13-13 double game point, they sent Groom. When the game is on the line, she is always there. While she didn’t compete with Fury at the U.S. Open or Pro-Elite Championships this season, Claire Desmond’s impact at the National Championships reminded the Division why she is one of the sport’s most decorated athletes. In addition to representing the U.S. at the international level eight times in five years, Desmond was on the 2015 All-Club 1st team and the 2016 All-Club 2nd team. Desmond’s cutting prowess shone in Fury’s midfield throughout the weekend, and she tied with Katie Ryan for second-most goals scored on Fury. But it was her work on defense this year that stood out. Desmond consistently shut down teams’ best handlers. High-pressure defense doesn’t often translate to the stats sheet – Desmond’s record only shows two blocks at Nationals – but it shows on the field. Her wide mark pushed handlers to change their edge on windy throws, and her quick feet and coverage made every reset cut a battle. Comments on "2017 Women’s Club Player of the Year, Presented By VC Ultimate"